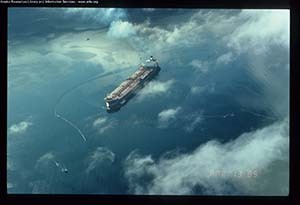 The Exxon Valdez oil spill is now the second largest oil spill to have occurred in the United States. The oil tanker Exxon Valdez ran aground on a charted rock, Bligh Reef, in Prince William Sound on Good Friday, March 24, 1989. The ship ran aground after leaving the designated tanker lanes to avoid icebergs reported to be in the area. Eleven million gallons (257,000 barrels) of Alaska North Slope crude oil spilled into the remote, pristine, resource-laden environment, less than 30 miles from Valdez. The oil fouled approximately 1,300 miles of wildlife-abundant shoreline. Spilled oil damaged shoreline from Bligh Reef to Kodiak Island and beyond. Oil washed up on shores near Chignik, as far as 470 miles from Bligh Reef, a distance comparable to that from Cape Cod to North Carolina. The estimated initial death toll of the spill included 250,000 seabirds, 2,800 sea otters, 300 harbor seals, 250 bald eagles, up to 22 killer whales, billions of salmon and herring eggs, and other intertidal plants and animals. Some injured species are still recovering. The people and economies of communities in the oil spill region suffered in the months and years following the spill. Commercial fishing and tourism were especially affected. The initial clean-up response in March 1989 was slow, ineffective and poorly coordinated. The first three days after the Exxon Valdez oil spill afforded nearly ideal weather for oil recovery. Seas and winds were calm. But the equipment wasn’t ready. 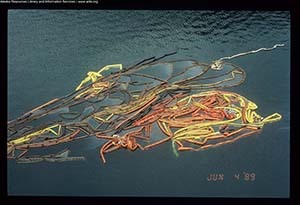 Seventeen hours after the grounding, neither the leading edge of the spill nor the grounded tanker had been boomed. The few skimmers on-scene were operating ineffectively. Oil is still present on some shores, despite mechanical and chemical (bioremediation) clean-up efforts totaling more than $2 billion between 1989 and 1992. Eight sections of beach near Chenega Bay were cleaned again in 1997. A casual scan of the shoreline reveals little evidence of oil, but weathered oil remains trapped beneath rocks and in the subsurface of the more heavily oiled beaches.